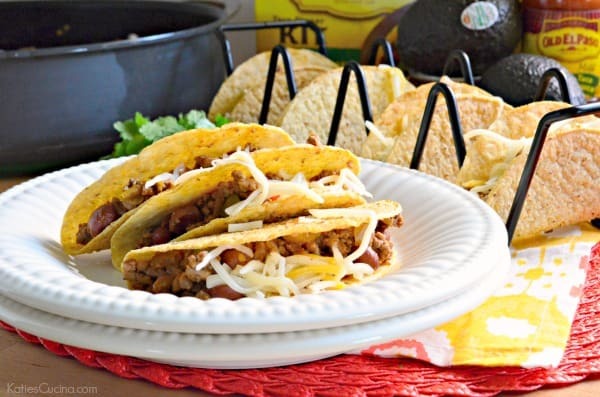 Combine ground beef with red beans to make an unforgettable taco night at home! An easy way to sneak in a few veggies too like onions and bell peppers, too! We love a good taco night at our house. We recently had friends over for dinner and I made these beef and red bean tacos. 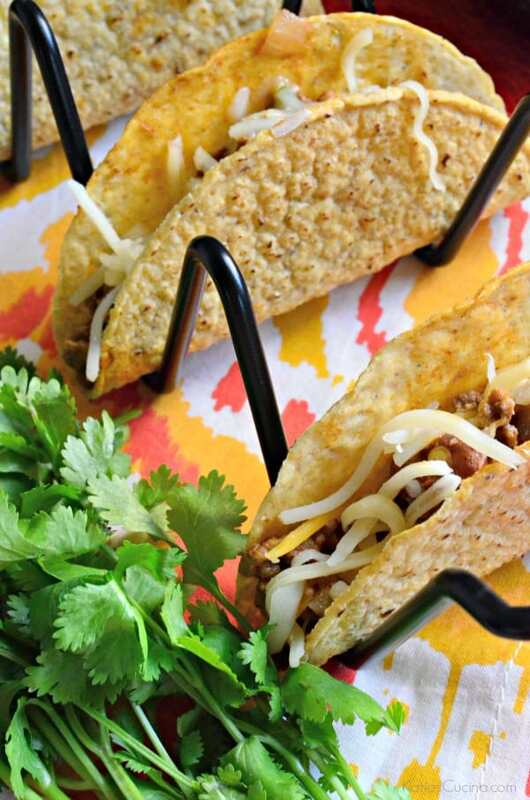 Tacos are always an easy go-to when entertaining. And let’s get real who doesn’t like tacos? For the kids I made them an easy cheese and refried bean quesadilla which they both gobbled up. Ryder even had some of the beef and red bean mixture and seemed to really enjoy it. He definitely loves all the Mexican recipes I cook! By adding beans to your taco mixture I feel like you can stretch it a little further because beans can act as a good filler substitute. I chopped up a white onion and half of a red and green bell pepper. I figured this is a good way to disguise the veggies and get a little extra serving of veggies in for the day. After the meat and veggies were cooked I added a 4.5 oz. can of Old El Paso Diced Green Chiles . This added a nice additional flavor to the tacos. Followed by a small can of tomato sauce and the taco seasoning packet. I mixed it all together and then let it simmer on low for 5 minutes. While the taco meat simmered I then baked the taco shells. I love using the Old El Paso Crunchy Taco Dinner Kit. It comes with everything you need for taco night; crunchy taco shells, taco seasoning, and taco sauce! And because I was entertaining for a crowd I picked up an additional pack of 12 crunchy taco shells. After the taco shells were cooked I added in the beef and bean mixture and topped with a generous portion of shredded Mexican cheese. Then let your guest top their tacos with whatever they enjoy most. I love making guacamole with Avocados From Mexico. Whether you’re feeding a family of four or entertaining a large group of friends, avocados are always the perfect addition to any meal. Is there a fruit more versatile than the avocado? You can slice it, dice it, smash it, or serve it whole. It tastes great at breakfast, lunch, and dinner, or as a satisfying snack any time of day. And the best part is, you get the same nutritional boost whether you serve it on a sandwich, mix it into a dip, blend it into a smoothie, or eat it all by itself. In fact, avocados are so popular at parties and festivities that people across the United States enjoy more than 1.3 billion pounds of avocados per year. 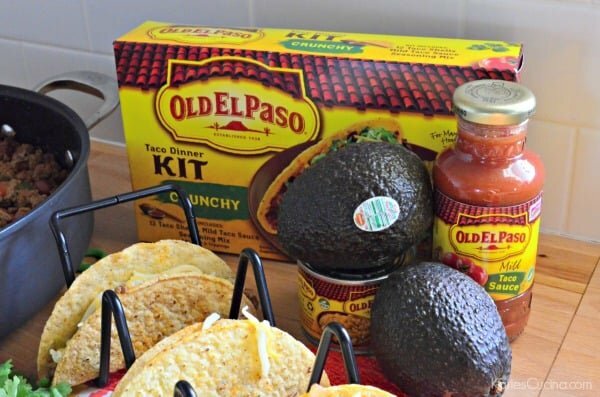 If you shop at Publix Supermarkets you can download $1 coupon to save on Old El Paso products to help you save on your next fiesta! And to help you celebrate Cinco de Mayo I’m giving away $25 in paypal cash. Please wait for the widget to load. Once the widget loads follow the prompts to be eligible to win. You must have a Paypal account to receive the $25 cash deposit! Open to anyone who has a Paypal account. No age restriction. I will email winner and winner has 48 hours to respond with paypal address for cash deposit. In a large skillet begin to brown the ground beef, breaking it up into bite-size pieces. Add in the diced onion and bell pepper. Cook until the beef is brown and no longer pink (about 10 minutes on medium-high heat). Add the rinsed and drained red beans to the skillet, tomato sauce, diced green chiles and taco seasoning. Mix well and cook on low for 5 minutes. While the taco meat is simmering begin to heat up the taco shells. Unwrap taco shells, place on a cook sheet pulling apart the taco shells slightly. Bake at 350 degrees Fahrenheit for 5 minutes until crisp and golden brown. 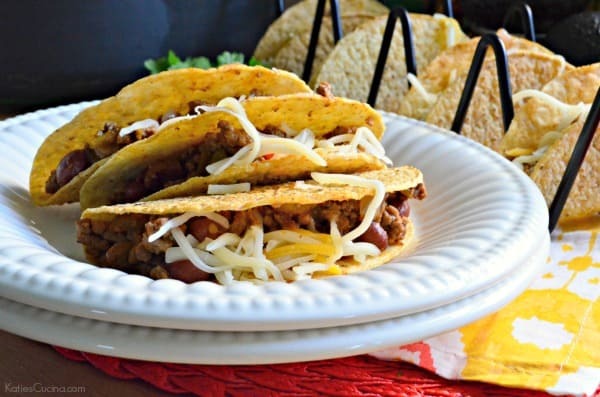 Once taco shells are done carefully scoop in taco meat and top with a generous portion of Mexican cheese. Eat as is or enjoy with additional toppings like shredded lettuce, salsa, slice olives and/or guacamole. I’d like to try the Old El Paso® Refried Beans. I love Old El Paso Refried beans-they are the best! The Chopped Green Chiles are one of my favorites. I would try the Old El Paso refried beans…I love them! I’d like to try their Spanish Rice (Rice & Beans). 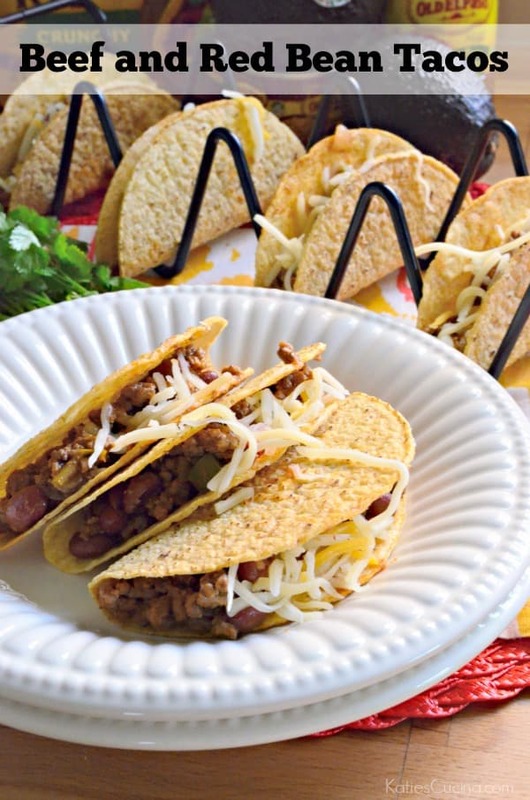 I would love to try the Bold Nacho cheese Stand ‘N Stuff™ Taco Shells at my next fiesta! I would love to try the Stand ‘N Stuff™ Soft Flour Tortillas. I want to try the Old El Paso Crunchy Taco Dinner Kit. I want to try Stand ‘N Stuff Taco Shells. I’d like to try the Old El Paso™ Stand ‘N Stuff® taco shells. I would like to try the refried beans. I want to try Flour Tortillas, 8-count for Burritos! I’d like to try their Gordita Dinner Kit. Well you can’t beat tacos as an all time winner. I use Old El Paso products particularly the beans. I would like to try the Bold Nacho Cheese Stand ‘N Stuff Taco Shells. I want to try the Fajita Dinner Kit. We love Old El Paso products in our household. I would love to get the tostada shells for our next fiesta! I’d get the Stand And Stuff Taco kit! YUM!!! Crunchy taco shells for me! Oh I would love to get the Stand ‘N Stuff™ Soft Flour Tortillas and make the Slow-Cooker Creamy Chicken and Green Chile Tacos! Would love to use the Avocados to make the New York Deli Guacamole Recipe to put on top! Oh that would be so good! I would like to try the Stand N Stuff Taco Shells. These are the perfect shape! I didn’t know they sold Fresh Salsa. I’d like to mix that with iipe avocados for a quick & easy guacamole. I wanna try Taco Shells. I would like to try the Stand n Stuff Flour Tortilla shells. I’d like to try the Flour Tortillas, 8-count for Burritos. I would love to try the old el paso refried beans. The buffalo chicken tacos sound so good!! I love all the taco recipes. I’d try the Jalapeno Slices Pickled and the Cheesy Mexican Rice. I would love to try the stand n stuff soft taco! I’d like to try the hot enchilada sauce. I’d love to try the re fried beans.